It is common for people to use tropes and exaggeration to make a point, even when the original meaning has changed or been forgotten. I referred to my current employer as the Thieves Guild because they cheat employees out of their pay. People can pick up the meaning even if they are unaware that the term came from various fantasy stories, and is used in role-playing games. My wife likes to put peanuts outside for the blue jays, nuthatches, and titmouses. A few minutes ago, she did this, and told me, "I had 500 blue jays out there!" Uh, no. She was using exaggeration to add color and make her point. Writers of the Bible used expressions that were not meant to be literal (such as sunrise and sunset, words that are regularly employed by many people who know full well that the sun does not actually rise or set). Some owlhoots are playing the "Gotcha!" 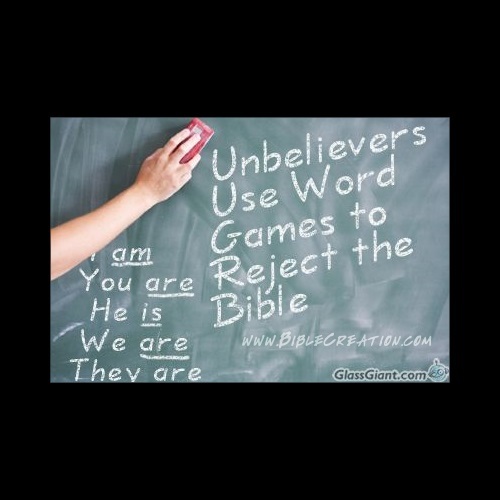 game by saying that phenomenological language means the Bible has errors. This somehow gives them license to insert different meanings into the text so they can justify their beliefs. We expect atheists to contrive various excuses to claim that the Bible is untrue, but there are professing Christians who commence to badmouthing the Bible so they can justify deep time, theistic evolution, and other things. In a 2005 debate with Dr. John Crossnan, Dr. James White said something better than I have done: "In my experience, those who argue against the authenticity of the gospel accounts always do so in defense of a preexisting commitment to a particular religious or anti-religious viewpoint." In this case, people are denigrating Scripture so they can believe things that it doesn't say. They claim to believe the Bible, but like atheists, they reject its authority. Denis Lamoureux seeks to resolve perceived contradictions between science and Scripture by persuading that Scripture is not inerrant, but is infallible in doctrine, and he reasons that the phenomenological language defense (as he terms it) fails to recognize the impact of ancient science upon the text. This is in contrast to the Chicago Statement on Inerrancy, which argues that phenomenological language does not invalidate the inerrancy of the Bible. Lamoureux describes himself as a “literal non-literalist,” but his work exhibits a certain naïveté about lexical semantics (along with a number of other hermeneutical issues undergirding his analysis). The problems with Lamoureux’s analysis can be seen, for example, in his analysis of the mustard seed motif in the gospels, and a wholly inadequate understanding of the idiomatic nature of hyperbole. But, more telling is his failure to recognize the impact that ancient science might have on the terminology used to describe natural phenomenon. This problem is best demonstrated by the impact that ancient theories of biology on the semantic domain of the words translated “heart” in the Bible. This being the case, his arguments against the inerrantist position loses much of its force. To read the rest, click on "Phenomenological Language and Semantic Naïveté".